This article describes the inner structure and organization of the elements which build the RadDesktopAlert control. 1.1. AlertWindowCaptionElement: represents the caption of a RadDesktopAlert. It contains a caption grip which is used to move the alert window, close button and options drop-down button. 1.1.1. AlertWindowCaptionGrip: represents the part of a RadDesktopAlert that can be used to move the component on the screen. 1.1.2. 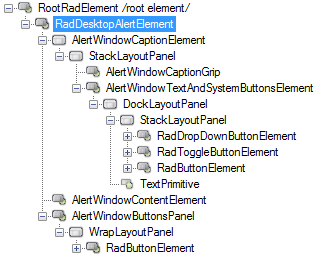 AlertWindowTextAndSystemButtonsElement: represents the part of a RadDesktopAlert that contains the text and the system buttons. 1.2. AlertWindowContentElement: represents the content of a RadDesktopAlert component.The content usually is built of an image and HTML enabled text. 1.3. AlertWindowButtonsPanel: represents the element which holds the buttons that can be added in a RadDesktopAlert window.